All you guys looking for a good product that will last, check out this site. I have had great luck so far. www.epoxycoatfloorpaint.com You will have to copy and paste this link into your web browser. This is a very quality and durable product in my opinion. It is a 100% solids oil based epoxy vs. those water based epoxy paints where alot evaporates off when drying. With this stuff, wet thickness is the final thickness. If you go according to the directions you should have good luck. Make sure you are familiar with the directions and if you have any questions, don't be afraid to call them. Epoxy. And do not forget the sand. I had new carpet put in my house so I layed the old carpet on the floor in the garage. Never have the car in the rain so thats no problem. Plus it makes it nicer when you are working under the car in my opinion. Also my baby has her own rug to sleep on under her cover. I cleaned, and sealed the floor and put down sticky floor tiles. Can't use any kind of jack and a PITA to keep clean. I'd never do it again. Check out this web site. It covers a lot of garage related topics. wish i knew about it before I did last garage. I used the Rust-Oleum garage product, 4 years and still looked great. . Prep is really the key, use muriatic acid (2X) to clean floor, wash off with baking soda mix, rinse (2X) then let dry for a few days. Find a decent stretch of no rain/65 degree weather in the spring, you'll be good to go. If you can get someone to start doing edges when mixed, then you roll right behind, job doesn't take long. Start in early morning. Worst part is no car traffic for 7 days and keeping toolboxes and stuff outside under tarp for 3 days. I had no hot tire pickup and have used floor jacks and stands with no problem. And don't forget to mix in some anti-skid product (I used BEHR) after you mix the epoxy. Wanna go nuts, then add a clear coat. Looks wet all the time. Have fun, it comes out looking good, you'll love it. I have a clean bare concrete floor and would never change it. THe problem with all of this sort of thing is it ends up something else to maintain and keep clean. I would hate to do any serious work on an expensive floor. I think they look great but if you work in your garage this seems like a potential headache. I don't have one of these designer floors so maybe I am incorrect. Anybody here do real work with on one of these fancy floors ? Some good tips!!!!! I'm thinking of tackling this job in the spring using the Rust O Leum kit. I've been wanting to do it for years, but I live on a dirt road and dust is going to be a problem. Thanks for all the details. That sounds like a good plan. Now I just need to wait for winter to end. Being in the Northern half of Illinois, it will probably be May before I can get the ideal weather. Last edited by jimmymack; 01-23-2009 at 05:06 PM. Good point. I am pretty sure my floor is sealed also. Tile...That's what I'm talkin about!! Always liked the black and white "checkered flag" look. Yeah, yeah, NOT original. But! It sets the tone of the room and contrasts nicely with the two Vettes that would live there! I went with the floor tiles. The ones I got are plastic and very durable. I love it! be really careful if you use a non-epoxy paint.my florida home garage was coated with a solvent based product of some kind by the builder. ererything made of rubber stuck to the floor including the door seals. i had to use a shovel to break the door seals loose from the floor.then a repaint did not help.the builder finally painted the floor a third time,put new seals on the doors and glued threshold seals to the floor at the three overhead doors. still had some minor problems with rubber items and tire marks. use epoxy if at all possible. in my michigan shop ,with an epoxy coating,i will get rust stains . i remove them by brushing with muratic acid--then wash with water . Alot of these garages are very nice, a couple of them are REALLY nice. I couldn't imagine pulling a trans on one of these floors though. 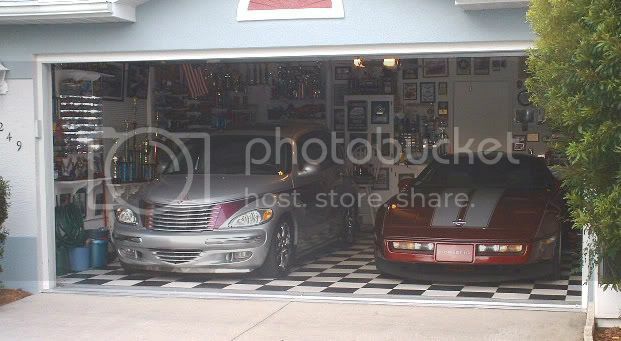 In a perfect world an attached four car garage done up like a museum would be great, then a nice 50X90 out back for the real work. 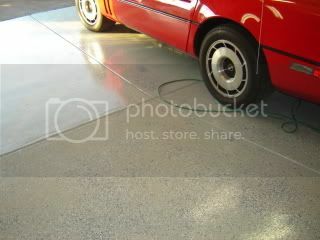 I painted my garage floor last Spring with the Rustoleum 2 part epoxy kit available at Home Depot. Followed the instructions regarding cleaning, mixing, humidity & air temperature, etc. The floor came out better than my expectations. I used the plastic chips for color and to reduce slippery conditions. For approximately 750 sq. feet of garage floor I used 3.5 kits at about $65 per kit. I have experienced no problems with the paint and temperatures have been down into the low teens at night here lately. Only advice is to apply rather liberally with a paint roller and be sure any oil stains on bare concrete are cleaned up as well as possible. I waited 4 days to dry thoroughly and was good to go. I used race deck tiles. 2 light coats of blue. then the glitter. then 2 coats of clear with anti slip added. Extremely slippery when temps 32F or lower when wet. Plus water and ice chunks stay forever. Need to squigy or broom to remove.. Not porus! Looks great when clean. Tires leave black marks on it but can scrub off with muscle. Last edited by Rohn; 01-30-2009 at 03:39 PM. 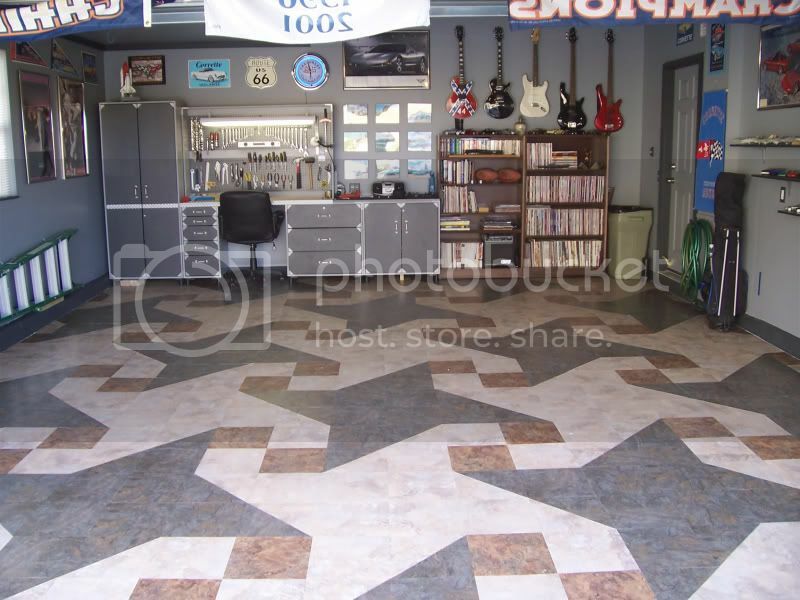 Quick Reply: Have you painted your garage floor?